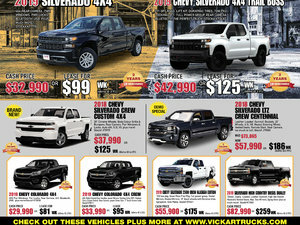 Vickar Community Chevrolet’s pre-owned special of the week! Introducing the 2016 Chevrolet Impala: the perfect full size family sedan to offer luxury, comfort and space for everybody; with a price tag of only $22,999 (plus taxes) help us find this pre-loved impala a new home! Comes with features such rear vision camera, rear park assist and remote start the impala is equipped with features to ensure you drive confident on the road. Equipped with the latest technology from Bluetooth, apple Carplay, android auto and WiFi being connected has never been this easy.